Growing up as sons of a showbiz couple will never be easy. 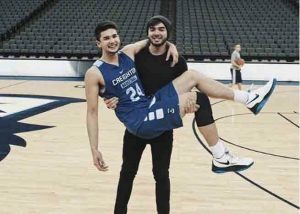 Brothers, Kobe and Andre Paras have been under the showbiz spotlight since they are born. 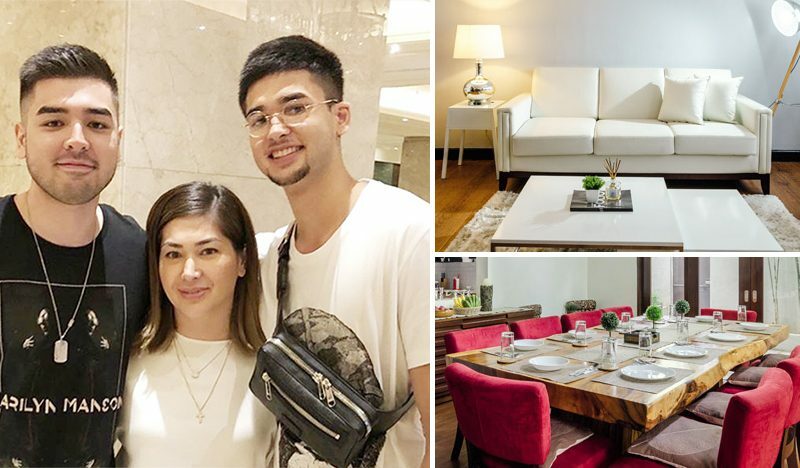 They are the sons of the Basketball player and comedian Benjie Paras and actress Jackie Forster. They grew up keeping they lives away from the showbiz world but the industry kept on tracing their ways to it. Kobe is now busy on his basketball career being one of the most talked about players in the country and even making names internationally. On the other hand, Andre continued his parents paths on acting being on shows, movies, and basketball too. Last September 2017, the Paras’ was featured on YES! Magazine opening the doors of their three-storey house to the public. 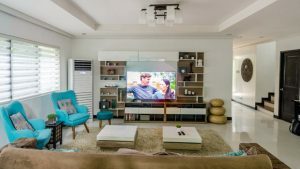 Their house stands on a 400 sq.m lot having a modern Asian design with spacious common areas, relaxing bedrooms and a homey-vibe of the entire house. 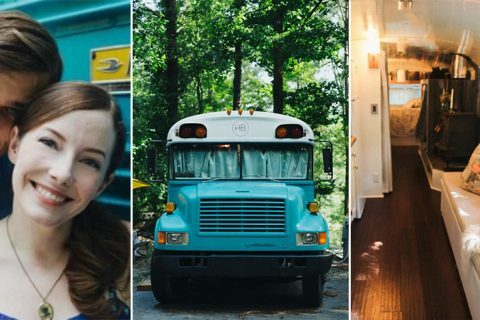 Benjie and his wife Lyxen worked together on getting the house interiors done with the help of their favorite magazines, Fixer Upper and their favorite show on HGTV. “Yong wife ko kasi we’d always watch HGTV, and then titingin sa magazines. 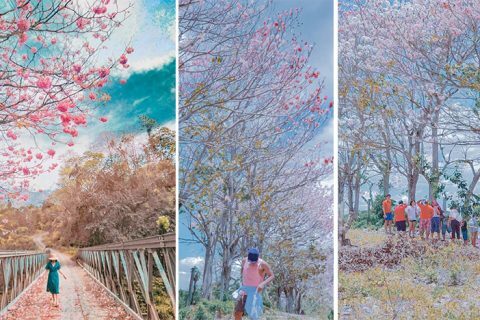 ‘Tapos magka-canvass kasi, kasi ‘yong iba mahal. ‘Yong kukuni namin e ‘yong mirror image n’ong gusto namin [na furniture].” Benjie shared. 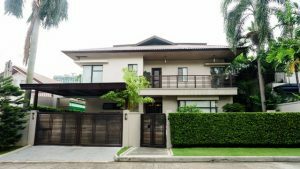 A few years ago, the family used to live in Quezon City and decided to move into the house he acquired a decade ago due to high rent prices. His first plan about the house was to finish and sell them afterward but it changed. The interior of the house can be first notice from the outside from it facade because of its clean lines and off-white colors. The actor admitted that maintaining the color of it was quite challenging. “Very light lang, parang off-white. Ang mahirap lang kapag off-white amsa labas, parang every how many years kailangan mong i-repaint.”he added. Completing the facade of the house are green plants planted over the front part of the house. Entryway Welcoming you before getting inside the house are dark-colored wooden doors that hooking you up to the Asian vibe of the house. Benjie put everything he likes about the house- it’s maaliwalas. It’s the place where the whole family spends most of their times together, while Benjie and her wife is busy watching the television the kids are having their kind of scribbling on the carpet. Wooden furniture is used to add warmth to the area. 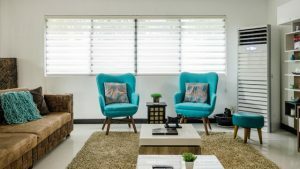 The living area has a huge tv, an open shelf that holds a bevy of accessories, two swivel coffee tables with secret storage compartments, matching high-back accent chairs, a stool in the same shade of blue, a shag rug and a remodeled sectional couch. Few steps away from the living area is the room they called the White Room because of its crisp color scheme. Everything inside the room is well-loved non-color kinds of stuff. Attracting your attention is the table lamp and the tripod floor lamp placed in the corner. “My wife bought this lamp. Sabi niya ‘Okey, lagi kang nai-interview sa bahay, so atleast meron tayong similar sa trabaho mo.’” Benjie stated. The space is perfect for entertaining the guest, having a self-time or just reading books. A hanging chair with brown-colored stand serves as baby Georja’s duyan. With the house’s color scheme, we’ll wonder how the couple keeps the house this clean. Benjie admitted that during regular days, toys and other stuff are messing the area but her wife plans to get some shelves for these right after the renovation of the house. Benjie is planning to make this room his own place, a man cave. It’s mine. Hindi ko palang napapaayos. Ang plano ko kasi talaga,man cave. Gagawin para sa akin, parang hangout, kasi may sari-sarili naman silang rooms na sa itaas.” Benjie told. A big shelf holds all Benjie’s wards from his wonderful basketball career. Dining Area The room has high ceilings, huge windows, and glass sliding doors. “Pinataas ko na ‘yong ceiling. Gusto talaga ng wife ko, ganyan, para maliwanag” Benjie stated. Can you imagine that the dining and kitchen area are non-existent on the original plan of the house? It was until 2015 when Benjie decided to renovate the bare space. They used ceramic tiles that look like wood to separate the kitchen from the dining area. The Dining area has high ceiling, huge windows, and glass sliding doors. “Pinataasan ko na ‘yong ceiling. 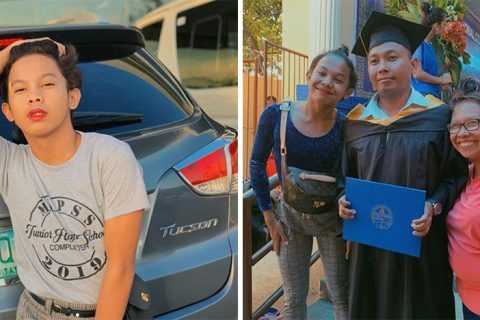 Gusto talaga ng wife ko, ganyan, para maliwanag,” Benjie told. 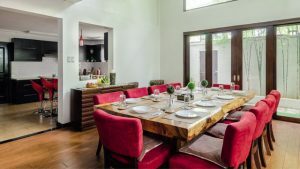 The dining table is made from ipil wood and is surrounded by 10 well-upholstered chairs. The table was bought in Tagaytay and needed 8 persons to carry it. “Naghanap talaga kami. Makikita mo ‘to, raw, as in, ando’n lang nakatambak. So, mamimili ka ng size, ‘tapos ‘tsaka nila aayusin. Kaya solid talaga,” he adds. The area has a mix of modern, masculine and industrial sway. Benjie and his son Kobe use the space more often and this is where the family do the catch ups during their meal times. 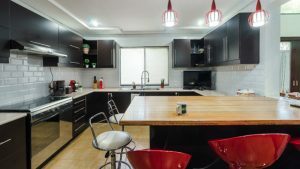 The kitchen has off-white countertops, white subway tiles as a backsplash, and black cabinets where supplies and dinnerware are stored. 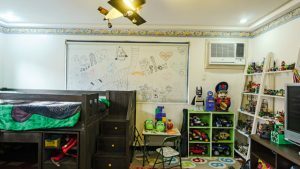 Riley and Sam shares this room with laminated flooring, shelves filled with toys, and identical kiddie loft beds. 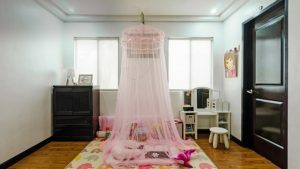 The room has playful designs that suit the kids’ environment. This is really Kobe’s room but since he stays longer in the US than in the Philippines, the family decided to make this for their unica ija named Georja. It has a cabinet, mini vanity area and pink mosquito net covering the girl’s bed making it look like on the fairytales. 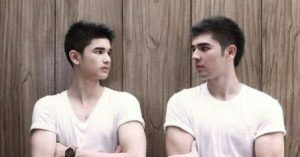 Andre is the eldest among Benjie’s kids and his room is found at the attic. The entire third-floor attic was then a bodega but as per Andre’s request, it was renovated to be his room. 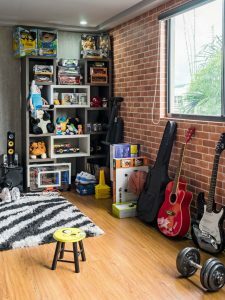 It has its own receiving area, used brick wallpapers on the walls, collection of his Adventure Time memorabilia, gym equipment and many more like electric and acoustic guitars, shelves and other collectibles. Kobe stays here with his Kuya when he’s in the Philippines. Andre took over on paying for the construction of this. 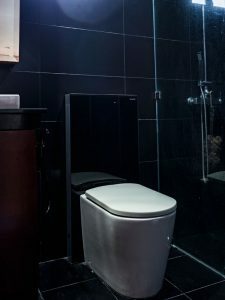 It is a toilet and bathroom with modern-meets-industrial. Benjie also helped Andre on completing the space since he has a lot of idea from watching HGTV everyday.